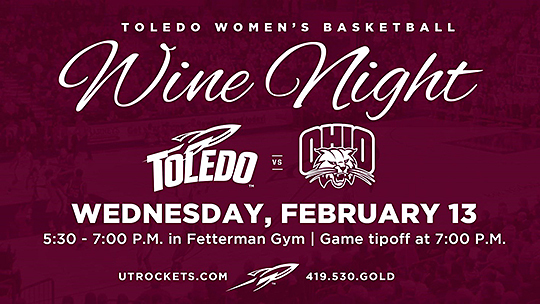 The University of Toledo will host the second annual Rockets’ Wine Night at Savage Arena prior to the women’s basketball game vs. Ohio Wednesday, Feb. 13. Heidelberg Distributing will feature 11 of its most popular wines in the Fetterman Practice Gym beginning at 5:30 p.m. Tipoff for the game is 7 p.m. The cost for the event is $30 and includes a game ticket, 10 wine samples and appetizers. Tickets to the event are $23 for fans who have already purchased their game tickets. The cost for designated drivers is $19 and includes game ticket and appetizers with soft drinks. This event is for fans 21 and older. To purchase tickets for the event, go to the UT women’s basketball website. All attendees will be required to show a valid photo ID upon entry. No refunds or exchanges will be provided for failure to provide ID or failure to attend. Attendees can redeem their event voucher at the door of the Fetterman Practice Gym from 5:30 to 7 p.m. for access to the pregame event. Five local wines from Stoney Ridge Winery will be available and a focus of the evening. Stoney Ridge Winery is located in a country setting in the northwestern region of Ohio. The winery and vineyard was opened in 2002 by Pamela Ledyard. Her oldest son, Ryan Towne, began making their wines in 2011, and Ryan’s wife, Abby Towne, has been the winery manager since 2013. This family-run business grows more than 20 different varieties of grapes in their 13-acre vineyard. The winery is open year-round and offers live music and food on weekends. For tickets, call 419.530.GOLD (4653), go to the Toledo Rockets website, or stop by the UT Ticket Office in Savage Arena. This entry was posted on Wednesday, February 6th, 2019 at 3:35 am and is filed under Athletics, Events .